Paperback 195 mm x 128 mm (73/4 in x 5 in), 255 pages. MirrorDanse's first mass market title. 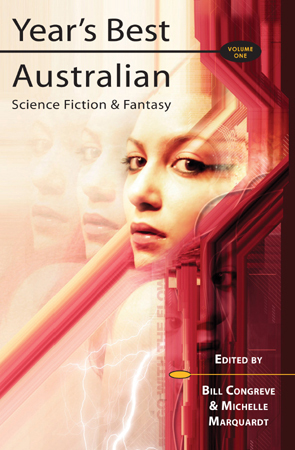 Australian science fiction and fantasy have come of age. The independent press SF movement is one of the most dynamic literary scenes in Australia at the moment. This book captures the best of that movement, from Australia's best SF and Fantasy writers: both newcomers and those with established reputations. You'll find the traditional, the street-smart, the amusing and the adventurous. From urban fantasy to the myths, dreams, and warriors of the future; from the death of the nation to its rebirth; this collection plots a course across the works of the leading writers and dynamic newcomers of the genre. Stories that share a common desire to explore mankind in a moment on the edge. This is the joy of the written word as it was meant to be: inventive and challenging. Michelle Marquardt: Has an honours degree in veterinary science. She is the author of the George Turner prize-winning novel, Blue Silence which was also shortlisted for both the Aurealis and Ditmar awards. Damien Broderick is the award-winning non-fiction author of The Spike and The Last Mortal Generation. Novels include The White Abacus and, recently, Godplayers, written with the assistance of a Literature Board of the Australia Council Senior Fellowship. Terry Dowling is a book reviewer and occasional columnist for The Weekend Australian, and one of Australia's most awarded genre writers. Books include Rynosseros, Worm-wood, Blue Tyson, Blackwater Days and Twilight Beach. Margo Lanagan is the author of the award winning collections White Time and Black Juice, as well as numerous YA fantasy novels. Margo has won the Victorian Premier's Prize for fiction, and has been shortlisted for two World Fantasy awards. Ben Peek's novel, Black Sheep, is forthcoming from Prime Books. This story was partly inspired by Mark Twain's visit to Sydney and John Birmingham's history of Sydney, Leviathan. Lynette Aspey lives with her partner and child on a yacht, currently cruising the Caribbean. Stories in Aurealis, Asimov's and Year's Best Young Adult SF. Deborah Biancotti is the winner of the Aurealis Award and two Ditmar Awards. Stories in Altair, Southern Blood, Agog! and others. Brendan Carson's stories have appeared in Altair and Antipodean SF. Rjurik Davidson's stories have appeared in Fables & Reflections, Aurealis and SciFi.com. Brendan Duffy's short stories have appeared in Agog!, Orb and Year's Best Science Fiction. He is currently working on a novel. Geoffrey Maloney has numerous story credits, both in Australia and overseas. A collection, Tales From the Crypto-System, was published in 2003 by Prime Books. Cat Sparks is the multiple award winner for her writing, artwork and publishing, and is the founder of Agog! Press. She is the publisher and editor of the Agog! zseries of anthologies. Her short stories have appeared in a number of magazines and anthologies. Kim Westwood's short stories have appeared in Agog!, Redsine and Encounters. One story was reprinted in Hartwell's prestigious Year's Best Fantasy, 5.